Loading hose attached during departure. 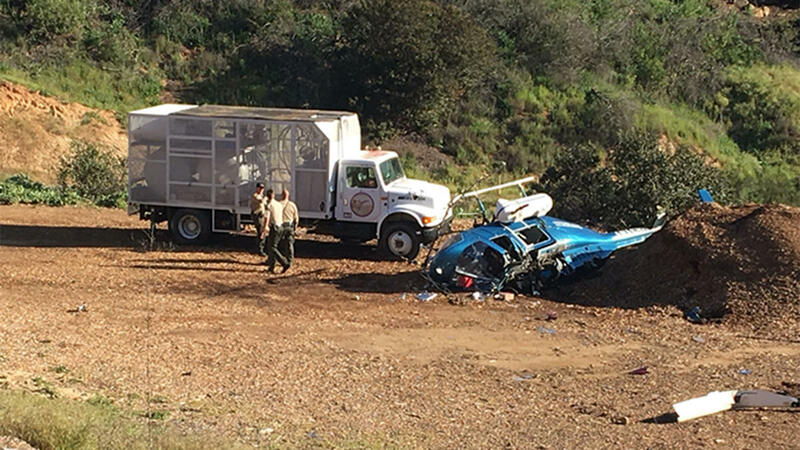 A worker refilling an agricultural spraying company’s helicopter with pesticides was hurt Friday morning when the rotorcraft crashed in Valley Center in San Diego’s North County. The incident happened around 7:30 a.m. at McNally and Muutama roads, the Valley Fire Protection District said. A NorthComm dispatcher told NBC 7 a helicopter had gone down; the rotorcraft sustained heavy damage and wound up on its side. Aerial images captured via SkyRanger 7 showed the chopper, bright blue in color, in a small, dirt field on the shoulder off the roadway. San Diego County Sheriff’s Department Sgt. Michael Tingley said the rotorcraft was carrying the 51-year-old pilot/owner of an agricultural spraying company and a 35-year-old passenger who also works for the company. The pilot told deputies he was in the process of spraying an avocado orchard in the area and had landed his chopper atop a large, white truck containing the pesticides. Tingley told NBC 7 the worker had just finished filling up the pesticide tank and the pilot tried to take off before a hose had been disconnected. This yanked the passenger back, injuring him and causing the helicopter to crash. "(The pilot said) he lifted a little soon and snagged the filler hose, which then rotated the helicopter and it crashed," the sergeant explained. "The hose hadn’t been disconnected yet. The helicopter started to take off, the hose received tension on it, pulled the helicopter back down and then a catastrophic roll occurred with the helicopter," added Capt. Joe Basinski, of the Valley Center Fire Protection District. The sheriff’s department said the worker suffered minor injuries to his leg as well as some cuts to his face that he got from the helicopter's blades. The pilot, who officials said is highly experienced, was able to safely get himself out of the helicopter and was not injured. Basinski explained how firefighters helped the victim. 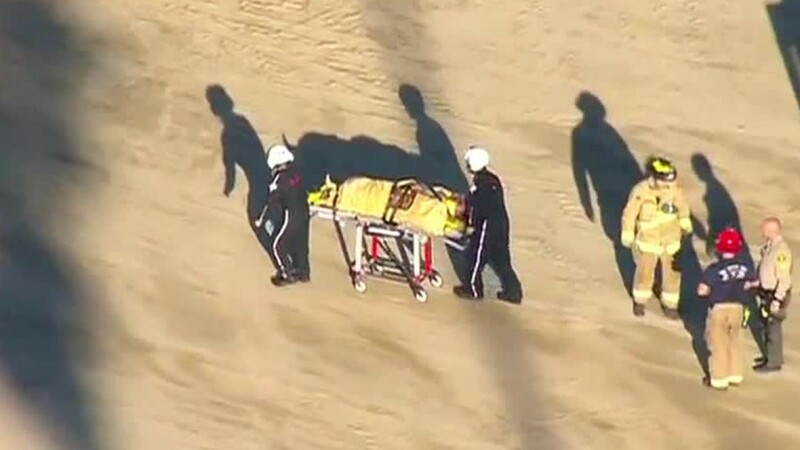 "He was on top of the (refueling) truck, so we had to set up a little rescue system in order to be able to get him down with the use of ropes and ladders," the fire captain told NBC 7. Medics, as well as an air ambulance, were called to the scene to help the passenger. At around 8:10 a.m., SkyRanger 7 captured images of medics loading the patient onto a stretcher. He was then loaded into a Mercy Air ambulance that took off from the scene about five minutes later. Officials said the victim was taken to Palomar Medical Center. The victim is expected to recover and Basinski said, in the end, things turned out alright. “There’s a lot of aspects of this incident that worked out in everyone’s favor. Remote location, fuel spills, all that,” he added. Officials said about 20 gallons of fuel spilled from the helicopter following the crash but, fortunately, a fire did not spark. Meanwhile, according to the Federal Aviation Administration, the helicopter is registered to a small, Valley Center-based company called Hummingbird, Inc. Aerial Applicators. 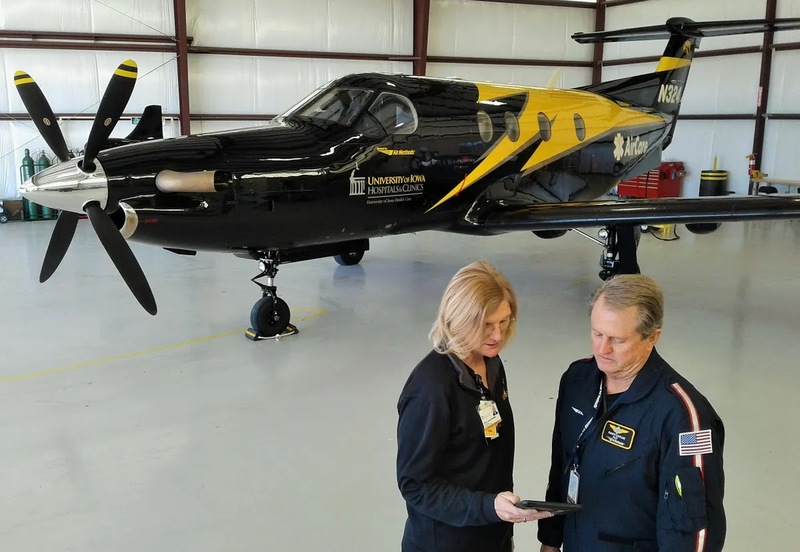 The company's website said it provides "aerial solutions" for the region, specializing in aerial agricultural application, trying to "get a hold of the diverse mosquito population." The website said the company has been in business for 40 years, helmed by an owner who flew chinooks in Vietnam. 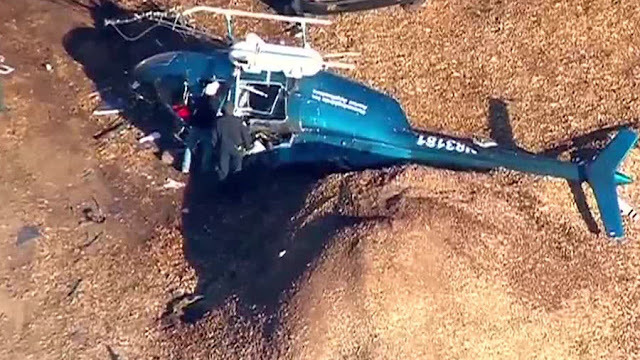 FAA spokesperson Allen Kenitzer told NBC 7 the rotoraft is a Bell 206B JetRanger II. The FAA and the National Transportation Safety Board will investigate the crash. Hours later, crews remained at the scene assessing the wreckage and figuring out ways to remove it from the area. (KGTV) – A crop-dusting helicopter crashed in the Valley Center area Friday morning, sending one person to the hospital with minor injuries. San Diego County sheriff’s deputies at the Valley Center Substation received a 911 call regarding a crash near Muutama Road and McNally Road at around 7:30 a.m. According to sheriff’s officials, the helicopter’s 51-year-old pilot said he was spraying an orchard and the crash occurred while the aircraft was being refilled with pesticides. While the pilot was not hurt, a 35-year-old passenger who was assisting with the refilling of the pesticide suffered injuries considered minor. 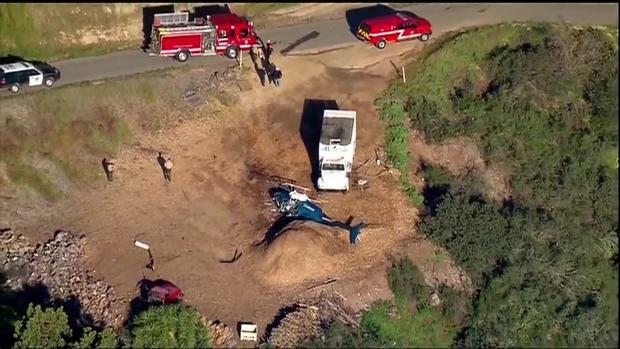 He was transported by Mercy Air helicopter to Palomar Medical Center for treatment. The National Transportation Safety Board (NTSB) is investigating the cause of the crash, sheriff’s officials said. I read that the workers face had cuts from the helicopters blades ... that’s a little to close to a beheading as one can get ! Glad he is ok .